Developing the skills to make creative, enduring photos enables you to preserve the essence of a person at a moment in time. During the class, you'll learn how to set up the shot and direct non-professionals like family and friends, how to use wardrobe, props and color, how to use natural and indoor light with a basic reflector to make your images more compelling and we'll experiment with visual storytelling. The Rutgers Master Gardeners of Mercer County will present a program for the public, “Pollinators and Pollination Strategies,” on Saturday, April 27, from 1 to 4 p.m. at the Tulpehaking Nature Center in Hamilton Township. The presentation will be delivered by naturalist and educator Mary Anne Borge, and will be followed by a guided walk in the Abbott Marshlands. This program is co-sponsored by the Tulpehaking Nature Center, Mercer County Park Commission and Friends for the Abbott Marshlands. For more information about the nature center, programs and schedule of events, visit www.mercercountyparks.org. The Princeton Festival will host its annual gala, " A Crystal Celebration," in honor of the festival's upcoming 15th anniversary season, on Saturday, April 27, at 6:00 pm at Cobblestone Creek Country Club in Lawrenceville, N.J. Guests will celebrate in elegant fashion with cocktails, fabulous hors d'oeuvres, silent auction with piano music, delicious dinner, entertainment, live auction, and dancing. Please join us for this popular major fundraiser which will provide important support for our 2019 season. 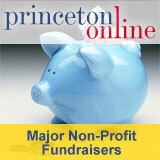 To learn more or to register, visit princetonfestival.org or call (609) 759-0379.